The Boeing 737 is a jet airliner. It is built by Boeing. It has two engines, which means that it is a twinjet. It also only has two rows of seats, which means it is a narrow-body airliner. At first, Boeing was making it to be a shorter, cheaper airliner than its 707 and 727. However, the 737 has become a family of nine different models. The number of passengers it can carry goes from 85 to 215. The 737 is the only narrow-body airliner that Boeing is making. The only types of 737 that Boeing is still making are the -700, -800 and -900ER. A version of the 737 with new engines and a new design, the 737 MAX, will come into service in 2017. Boeing began designing the 737 in 1964. The very first 737-100 flew in 1967. It was first used by an airline in February 1968. The 737-200 started being used in April 1968. The -200 was basically just a longer version of the 737-100. In the 1980s Boeing made the -300, -400, and -500 models. Boeing called these models the Boeing 737 Classic series. The 737 Classics could carry more passengers, and they had new engines: CFM56 turbofans. The 737 Classic planes also had some improvements made to the wings. In the 1990s, Boeing brought out the 737 Next Generation. The 737 Next Generation planes also had redesigned wings, a better cockpit and a new cabin. The 737 Next Generation is made up of the -600, -700, -800, and -900ER models. These models go from 102 ft (31.09 m) to 138 ft (42.06 m) in length. The Boeing 737 is the best-selling jet airliner in history. Boeing has never stopped making 737s since 1967. 7,283 aircraft have been delivered, and the Boeing 737 still has 2,759 orders that have not been delivered yet (as of August 2012[update]). Boeing 737s are built at the Boeing Renton Factory in Renton, Washington. The 737's main rival is the Airbus A320 family. On average, 1,250 Boeing 737s are in the air at any time and two land or leave somewhere every five seconds. The prototype 737. It was a -100 which NASA used for testing. Boeing was looking at designs for aircraft which flew short distances. Boeing wanted to make another aircraft to replace the 727 on short flights. It began designing the 737 on May 11, 1964. Boeing did a lot of research and found that airlines wanted an airliner which could hold 50 to 60 passengers. This airliner would also be able to fly routes 50 to 1,000 mi (80 to 1,609 km) long. Lufthansa was the first airline to order a Boeing 737 on February 19, 1965. They ordered 21 aircraft, worth $67 million (1965, $190.28 million in 2008). After Boeing spoke to Lufthansa in winter 1964, they made the 737 bigger so that it could hold 100 passengers. On April 5, 1965, Boeing announced that United Airlines had ordered 40 737s. United wanted a plane which was a bit bigger than the 737-100. Boeing made a different type of 737 for United, which was longer. This other plane was called the 737-200. Boeing changed the name of the original 737 to the 737-100. The first 737s were made near Boeing Field (now officially called King County International Airport) because the factory in Renton was too busy building the 707 and 727. After 271 aircraft were made at Boeing Field, Boeing moved the 737s to Renton. This was in 1970. The first Boeing 737-100 prototype was ready in 1966. It made its first flight on April 9, 1967. On December 15, 1967 the Federal Aviation Administration said that the -100 was allowed to fly with passengers. They gave it the Type Certificate A16WE. Lufthansa got its first 737 on December 28, 1967. On February 10, 1968, Lufthansa became the first non-American airline to fly a new Boeing aircraft. It was the only large airline which bought the 737-100. Only 30 -100s were ever made. The 737-200 first flew on August 8, 1967. The FAA allowed it to fly with passengers on December 21, 1967. The first flight it made for United Airlines was on April 28, 1968. It flew from Chicago to Grand Rapids, Michigan. Airlines liked the 737-200 much more than the 737-100. A "thrust reverser" is a part of the engine of a plane. It changes the flow of air through the engine so that it ends up trying to push the plane backwards instead of forwards. The first thrust reversers on the 737 were not very good. They were said to lift the aircraft off the runway when they were used. This meant that the wheels were not being pushed down onto the ground very much, which made the brakes less useful. In 1968, Boeing improved the thrust reverser. This improvement was put onto all aircraft after March 1969. Aircraft which were made before the improvement could have it installed. Boeing also improved the flaps. This improvement allowed the flaps to be used more during takeoffs and landing. All these changes meant that the 737 could hold more cargo and fly further. In May 1971, after the 135th aircraft was built, all of these improvements, as well as better engines and more fuel, were put into the 737-200. This gave it 15% more payload and range than the first 737-200s. This type of 737-200 became known as the 737-200 Advanced. A Boeing 737-200 Advanced from below. This is actually the United States Air Force T-43. In 1970, Boeing only got 37 orders for 737s. Since Boeing were running out of money, they thought about stopping making 737s and selling the design to Japanese companies. Boeing cancelled the Boeing Supersonic Transport and started making less Boeing 747s. By doing this, Boeing kept enough money to keep the 737 project going. In 1988, Boeing stopped making 737-200s. 1,114 aircraft were made and the last one was delivered to Xiamen Airlines on August 8, 1988. In 1979, Boeing started working on a large improvement for the 737. Boeing wanted to allow the aircraft to hold more passengers and travel further. It also wanted to make improvements to make the aircraft more modern. However, it also wanted to keep it similar to the older 737s. In 1980, information on this new type of 737 (called the 737-300) was given at the Farnborough Airshow. The CFM56-3B-1 engine was chosen to be the engine for this new 737 type. This engine burned much less fuel and was much less noisy. However, it was also difficult to fit these engines to the aircraft. This was because the 737's wings were not very high above the ground, and the CFM56 had a bigger diameter than the original engines. Boeing and CFM solved the problem by putting the engine slightly ahead of the wing, instead of right under it. They also moved some parts of the engine, which would normally go on the bottom, to the sides. This made the engine look a bit like a hamster pouch, because the engine is not shaped like a circle. The plane could now carry 149 passengers, because the fuselage of the plane was made bigger. Many changes were made to the wings. The tip of the wing was made longer by 9 in (23 cm). The wingspan was also made bigger. The flaps on the wings were changed. The flight deck (cockpit) was improved with electronic displays. However, airlines could choose not to have these in their planes. The main cabin (where the passengers sit) was also made better. It looked similar to the cabin of a Boeing 757. The prototype of the 737-300 first flew on 24 February 1984. Its pilot was Jim McRoberts. In June 1986, Boeing said that it was working on the 737-400. The 737-400 made the fuselage even bigger (by 10 ft (3.0 m)). This change meant that the -400 could carry 170 passengers. The 737-400's first flight was on February 19, 1988. The first airline to use it was Piedmont Airlines. Boeing made a 737-500 because its customers wanted one. It was a replacement of the 737-200. The -500 is 1 ft 7 in (48 cm) longer than the 737-200. Up to 132 passengers can travel on the 737-500. Cockpits with electronic displays could be installed on the -500, but airlines could choose the use the older cockpit if they wanted. The 737-500 was first ordered by Southwest Airlines in 1987. Southwest Airlines ordered 20 aircraft. The 737-500 flew for the first time on June 30, 1989. On February 28, 1990, Southwest Airlines got their first delivery. After the Boeing 737 Next Generation planes were brought into service, Boeing named the 737-300/-400/-500s the 737 Classic series. In 1991, Boeing started working on an updated group of 737s. They did this so they could have a plane to rival the Airbus A320. Boeing said that the 737 Next Generation (NG) program had begun on November 17, 1993. The -600, -700, -800, and -900 models are all part of the 737 Next Generation program. The 737 was changed so much by the 737NG program that it is almost like a new aircraft. However, some important parts of the plane were kept similar to the older 737s. The wing was changed again. Many different changes were made. An example of one is a bigger wingspan (made bigger by 16 ft (4.9 m)). Since the wings were made bigger, 30% more fuel could fit in the plane. CFM56-7B engines were used, which were newer, quieter and burned less fuel. The improvements to the wing, engine and fuel mean that the 737NG can travel 900 nautical miles further. This means it can travel over 3,000 nautical miles (5,600 km) in total, which means that the 737NG can travel between different continents. Winglets can be added to most 737NG models. The flight deck was given modern electronics (called avionics). The main cabin was also improved. An Air Berlin 737-700 in Boeing colours. It shows the winglets that can be used on 737NG planes. Boeing delivered the 5,000th 737 to Southwest Airlines on February 13, 2006. The 6,000th 737 was delivered to Norwegian Air Shuttle in April 2009. The Airbus A320 family has sold more planes than the 737NG over the past ten years. However, this total includes sales for the A321 and A318. The A321 has been the rival of Boeing's 757 and the A318 has been the rival of the 717. The Next Generation series helped make sure the 737 stayed the bestselling airliner family since it first flew. Since 2006, Boeing has been thinking about replacing the 737 with a completely new design. This was named the Boeing Y1 by people who worked at Boeing. This re-design would be launched after the Boeing 787 Dreamliner. Boeing did not decide on whether or not to go ahead with this. They said they would decide in 2011. On July 20, 2011, Boeing said that they were working on a new 737 version, which would have the CFM International LEAP engine. American Airlines said they would order 100 of these aircraft. On August 30, 2011, Boeing said that a new 737 would definitely be launched. It was called the 737 MAX. It would also definitely have CFM International LEAP-1B engines. The 737's main landing gear (wheels) go into holes at the bottom of the plane. The wheels do not have a door to close over them. The tyres can be seen easily when a 737 is taking off or is flying low-down. 737s do not have fuel dump systems. A fuel dump system is a system which gets rid of any unneeded fuel if the aircraft needs to make an emergency landing while it still has a lot of fuel on board. This is useful because aircraft can only land safely at a certain weight or below. Getting rid of unneeded fuel helps to get to a safe weight for the plane to land. The first 737s were too small to need these systems. Adding a fuel dump system to the bigger 737s would make the plane much heavier. Instead, if the emergency is not very serious, 737s fly around in circles to get rid of fuel. If the emergency is serious, the 737 just needs to land at an unsafe weight. If it has to land at an unsafe weight, the plane needs to be looked at for damage. If there is no damage, the plane can be put back into service. An engine on a 737-800, showing that it is not shaped like a circle. This shape is nicknamed the "hamster pouch". Engines on the 737 Classic series (300, 400, 500) and Next Generation series (600, 700, 800, 900) are not shaped like a circle like most planes. The 737 Classics had CFM56 turbofan engines. These burned much less fuel and made much less noise than the Pratt & Whitney JT8D engines which were used on the -100 and -200. However, because the 737's wings and fuselage are not very high above the ground, it was impossible to get the engines to fit on the wings. Boeing and CFM fixed this problem by putting the engines slightly ahead of the wings instead of putting them right underneath. They also moved some parts of the engines which would normally go at the bottom to the sides. This is what makes the engines non-circular. The gearbox of the engine was moved from the bottom of the engine to the side. The gearbox makes the engine look a bit like a triangle. Since the engine is close to the ground, it is possible that they can be damaged by things lying on the ground. The CFM56-7 engine on the 737 Next Generation burns even less fuel than the engines on the 737 Classics. The Boeing 737 MAX aircraft will have CFM International LEAP-1B engines. These engines are supposed to burn 10-12% less fuel than the CFM56-7B engines on the 737 Next Generation family. The 737's controls are very safe. If the hydraulics or both engines fail, servo tabs will be automatically used. Servo tabs are small hinges which move important parts of an aircraft. The tabs are controlled by the yoke (the thing used to steer the plane). For the 737 Next Generation, a new cockpit with LCD displays was made. These cockpits also have modern avionics (autopilot etc.). Most 737 cockpits have "eyebrow windows". These are smaller windows which are above the main windows. There are two on each side. Eyebrow windows were used on the Boeing 707. They helped the pilot see better when the plane was turning. However, because autopilot, advanced radar etc. exist, they are no longer needed. They were removed from the 737 cockpit in 2004. However, 737s used by the military still have them installed. If the customer likes, Boeing will install eyebrow windows for them. Winglets can be fitted to 737s which do not have them already installed. They can also be added when the aircraft is built. The winglets are about 8 feet (2.4 m) tall. They are fitted at the end of the wing and help the engines to burn less fuel because they reduce drag. They also help make less noise on takeoff. Winglets can help a plane burn up to 5% less fuel. As of July 2008[update] the 737 has carbon brakes. These are made by Messier-Bugatti. These new brakes have been allowed by the Federal Aviation Administration. They weigh 550–700 lb (250–320 kg) less than the steel brakes normally fitted to the 737 Next Generation family. If 700 pounds of weight is taken off a Boeing 737-800, it burns 0.5% less fuel. How the cabin looks was changed in each different type of 737 (Classic and Next Generation). The cabin design of the 737 Original was changed 737 Classic using designs from the 757. Designs from the Boeing 777 were used to design the cabin for the Next Generation 737. The newest cabin design is called the Sky Interior. It has curved walls. It also has redesigned windows. The Sky Interior has more headroom and LED mood lighting. Overhead bins which move have been installed. These bins are similar to the bins on a 777 and Boeing 787 Dreamliner. They have more space for luggage than the other designs. The Sky Interior is also designed to make the cabin less noisy by 2–4 dB. The first 737 with the Sky Interior was delivered to Flydubai in 2010. Malaysia Airlines, TUIFly and Continental Airlines have also ordered 737s with the Sky Interior. The 737 are split into three "generations". These are Original, Classic and Next Generation. The "Original" models are the 737-100, 737-200/-200 Advanced. The "Classic" models are the 737-300, 737-400 and 737-500. The "Next Generation" models are the 737-600, 737-700/-700ER, 737-800, and 737-900/-900ER. The fourth generation of 737 is called the 737 MAX. It is still being worked on, but when it is finished, it will be made up of the 737-MAX-7, 737-MAX-8 and 737-MAX-9. The MAX-7 will replace the 737-700, the MAX-8 will replace the 737-800 and the MAX-9 will replace the 737-900 and 739-900ER. The very first 737 model was the 737-100. It was first ordered by Lufthansa in 1965. The -100 was finished on January 17, 1967. It entered service in 1968. The aircraft is the smallest type of 737. Only 30 737-100s were ordered and delivered. No 737-100s are still being used by airlines. The 737-100 prototype is in the Museum of Flight in Seattle. The 737-200 is a 737-100 with a larger fuselage. It was created because of an order from United Airlines in 1965. The -200 was finished on June 29, 1967. It entered service in 1968. The 737-200 Advanced is an improved version of the -200. Its first user was All Nippon Airways. It began using the -200 Advanced on May 20, 1971. The -200 Advanced has many improvements. For example, more powerful engines and more fuel. The 737-200 Advanced can also fly further than the 737-200. The last delivery of a 737-200 aircraft was in August 1988 to Xiamen Airlines. This was the 1,095th 737-200 built. Many 737-200s are still used by airlines. After 40 years the last 737-200 aircraft in the United States were retired on March 31, 2008. This happened with the last flights of Aloha Airlines. The Boeing 737 Classic is the name of the 737-300/-400/-500. However, they were only called the 737 Classics after the 737 Next Generation (737-600/700/800/900) aircraft were made. Until then, the 737 Classics were called the 'new generation' of the 737. The 737 Classics were made from 1984 to 2000. 1,988 aircraft were delivered in that time. As of January 1, 2001, 1,945 are in service. The 737-300 was brought into service in 1981. It was used by both US Airways and Southwest Airlines. The 737-300 is the first model of the 737 Classic series. The -300 can usually hold 128 passengers. The 737-300 series was made until 1999. The last -300 was delivered to Air New Zealand on 17 December 1999. This was the 1,113th 737-300 made. The 737-400 brought into service in 1985. It was just a longer version of the 737-300. Piedmont Airlines was the launch customer. They ordered 25 aircraft in 1986. The first 737-400s were brought into service in 1988 with Piedmont. The last -400 was delivered to CSA Czech Airlines. This was the 486th -400 built. The 737-400F was a 737-400 changed into a cargo plane. The -400F was not delivered by Boeing. They were changed into cargo planes by the airlines that owned them. Alaska Airlines was the first airline to change a -400 to a -400F. It could carry 10 pallets of cargo. The 737-500 was finished 1987. It was brought into service with Southwest Airlines in 1990. The 737-500 is around the same length of the 737-200. It was a modern, complete replacement of the 737-200. The last 737-500 was delivered to All Nippon Airways on July 26, 1999. This was the 389th built. In the 1990s, Boeing realised that the Airbus A320 family was a serious threat. Boeing could lose customers because of it. In November 1993, Boeing began the Next Generation program. The Next Generation aircraft would replace the 737 Classics. The 737-600, 737-700 and 737-800 planes were planned. The 737-600 replaced the 737-500. It was also supposed to replace the McDonnell Douglas DC-9. The 737-600 was finished in 1995. The first aircraft was delivered to Scandinavian Airlines on September 18, 1998. The 737-600 is the only Boeing 737 still being made that cannot be fitted with winglets. The 737-600's rivals are the Airbus A318, Embraer 195 and Sukhoi Superjet 100. The Bombardier CSeries will also be a rival. 69 -600s have been delivered. There have been no orders that have not been delivered (as of 2010). The 737-700 was added to the Next Generation planes when Southwest Airlines ordered one in November 1993. The -700 was based on the 737-300. It was brought into service in 1998. It replaced the 737-300. Its main rival is the A319. 126 people can fit into the 737-700 if there are two classes (first class and economy). However, 149 can fit in if the aircraft only has an economy class. Boeing launched the 737-700ER on January 30, 2006. "ER" stands for "extra range". This means that the plane can fly further than a normal 737-700. All Nippon Airways was the launch customer for the -700ER. It has the body of a 737-700, but the wings and landing gear of a 737-800. It can fly for 5,510 nautical miles (10,205 kilometers). 126 passengers can fit onto the plane. In July 2008, Delta Air Lines got the first -700 that had Messier-Bugatti's carbon brakes. The 737-800 is a longer version of the 737-700. It replaces the 737-400. The -800 was finished in 1994. It entered service with Hapag-Lloyd Flug (now TUIfly) in 1998. 162 passengers can fit into a 737-800 if it has two classes. Up to 189 can fit into a 737-800 if it only has one class. Its main rival is the A320. The 737-900 is the longest 737. Alaska Airlines was the launch customer for the 737-900 when it was launched in 1997. It got its first aircraft on May 15, 2001. The 737-900ER is the newest and biggest Boeing 737. It was made so that it could replace the 757-200. It was also made to be a rival to the Airbus A321. 180 passengers can fly on a 737-900ER with two classes. 215 passengers can fly if the plane only has one class. The -900ER can carry more fuel and has winglets. It can fly for around 3200 nm. The 737-900 is no longer made; Boeing only makes the 737-900ER now. In 2011, Boeing said that it was working on the 737 MAX program. Boeing will make three types of 737 MAX. These are the MAX-7, MAX-8 and the MAX-9. The MAX-7 will replace the 737-700, the MAX-8 will replace the 737-800 and the MAX-9 will replace the 737-900ER. The 737 MAX will have CFM International LEAP-1B engines. The wheel in the nose of the plane has been made longer. Deliveries are supposed to start in 2017. Southwest Airlines became the launch customer on December 13, 2011. Lion Air and others have made orders for 737 MAX planes. The 737 is used by more than 500 airlines. 737s fly to 1,200 places in 190 countries. Over 10,000 737s have been ordered by airlines. 7,283 have been delivered. Over 4,500 are still being used by airlines. On average, there are always 1,250 737s flying. On average, a 737 takes off or lands every five seconds. 25% of the world's jet airliners are Boeing 737s. As of July 2010, 383 Boeing 737-200s are still being used by airlines. Over 7,400 Boeing 737s have been built and delivered. This is correct as of December 31, 2012. As of December 2012[update], over 10,400 Boeing 737s have been ordered. 3,020 planes still need to be delivered. This is a list of how many planes have been built for each type of 737. This information is from Boeing.com. 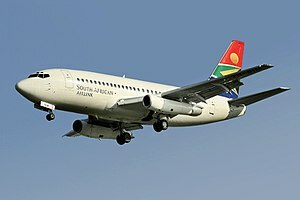 As of April 2012, the 737 has been in 315 incidents. 159 of these have been "hull loss accidents". A hull loss accident is when the plane is damaged so much it can not be used anymore, or if the plane was completely destroyed. 4,236 people have died because of these crashes. The 737 has also been in 106 hijackings. 324 people have died in hijackings. This information comes from: Boeing 737 specifications, 737 Airport Planning Report, b737.org.uk site. ↑ 1.0 1.1 1.2 1.3 1.4 1.5 1.6 1.7 "737 Model Orders and Deliveries data." Boeing, June 2011. Retrieved: July 25, 2011. ↑ 2.0 2.1 "737 price raised". Aviation Week. January 22, 1968. p. 31. ↑ "Airliner price index". Flight International. August 10, 1972. p. 183. ↑ 4.0 4.1 Kingsley-Jones, Max. "6,000 and counting for Boeing’s popular little twinjet." Flight International, Reed Business Information, April 22, 2009. Retrieved: April 22, 2009. ↑ "The Boeing 737-100/200." Airliners.net, Demand Media, Inc. Retrieved: April 22, 2009. ↑ 6.0 6.1 "Airbus A320 Aircraft Facts, Dates and History." Flightlevel350.com. Retrieved: May 12, 2010. ↑ 7.0 7.1 7.2 "The 737 Story: Little Wonder." flightglobal.com. Retrieved: January 7, 2008. ↑ 8.0 8.1 "Transport News: Boeing Plans Jet." The New York Times, July 17, 1964. Retrieved: February 26, 2008. ↑ Endres 2001, p. 122. ↑ Sharpe and Shaw 2001, p. 12. ↑ 11.0 11.1 Sharpe and Shaw 2001, p. 13. ↑ "German Airline Buys 21 Boeing Short-Range Jets." The Washington Post, February 20, 1965. Retrieved: February 26, 2008. ↑ Redding 1997, p. 182. ↑ 14.0 14.1 Wallace, J. "Boeing delivers its 5,000th 737." Seattle Post-Intelligencer, February 13, 2006. Retrieved June 7, 2011. ↑ Gates, Dominic. "Successor to Boeing 737 likely to be built in state." Seattle Times, 30 December 2005. Retrieved: February 10, 2008. ↑ "Original 737 Comes Home to Celebrate 30th Anniversary." The Boeing Company press release, May 2, 1997. Retrieved: April 12, 2008. ↑ 17.0 17.1 17.2 17.3 Sharpe and Shaw 2001, p. 20. ↑ 18.0 18.1 "Type Certificate Data Sheet A16WE." faa.gov. Retrieved: September 3, 2010. ↑ Sharpe and Shaw 2001, p. 120. ↑ Endres 2001, p. 124. ↑ "Powerplant - Reverse Thrust." b737.org.uk. Retrieved: November 1, 2011. ↑ Redding 1997, p. 183. ↑ Sharpe and Shaw 2001, p. 21. ↑ Sharpe and Shaw 2001, p. 23. ↑ "737 Family." Boeing.com, January 5, 2008. Retrieved: April 12, 2008. ↑ Endres 2001, p. 126. ↑ 27.0 27.1 Brady, Chris. "History & Development of the Boeing 737 - Classics." The Boeing 737 Information Site, 1999. Retrieved: September 5, 2010. ↑ 28.0 28.1 28.2 Endres 2001, p. 128. ↑ 29.0 29.1 Shaw 1999, p. 10. ↑ Redding 1997, p. 185. ↑ Shaw 1999, p. 7. ↑ 32.0 32.1 32.2 Shaw 1999, p. 14. ↑ Shaw 1999, p. 40. ↑ Endres 2001, p. 129. ↑ Endres 2001, p. 132. ↑ 36.0 36.1 36.2 36.3 Shaw 1999, p. 8. ↑ "Airbus A320 Family passes the 5,000th order mark." Airbus. Retrieved: September 3, 2010. ↑ "Airbus 320 Aircraft History, Information, Pictures and Facts." aviationexplorer.com.. Retrieved: September 3, 2010. ↑ "Airbus orders and deliveries." Airbus. Retrieved: September 3, 2010. ↑ "Boeing 737: Das meistverkaufte Flugzeug der Welt" (in German). Rhein-Zeitung, January 3, 2004. via Agence France-Presse. Retrieved: May 12, 2010. ↑ Robertson, David. "Boeing gets ready for all-new 737." The Times, March 12, 2007. Retrieved: April 22, 2010. ↑ Anderson and Eberhardt 2009, p. 61. ↑ O’Sullivan, Matt. "Boeing shelves plans for 737 replacement." The Sydney Morning Herald, January 2, 2009. Retrieved: April 22, 2010. Quote: Boeing will stick with the 737, the world's most widely flown aircraft. ↑ "Boeing airliner deliveries rise 11%." Chicago Tribune, January 4, 2008. Retrieved: April 22, 2010. ↑ Layne, Rachel. "Bombardier’s Win May Prod Airbus, Boeing to Upgrade Engines." BusinessWeek, February 26, 2010. Retrieved: April 22, 2010. ↑ Rahn, Kim. "B737: Best-Selling Aircraft in the World." Korea Times. Retrieved: April 22, 2010. ↑ "Boeing 737 Aircraft Profile." Flight Global. Retrieved: April 22, 2010. Quote: the best selling commercial airliner in history. ↑ Jiang, Steven. "Jetset: 'Tianjin Takes Off'." The Beijinger. Retrieved: April 22, 2010. Quote: A320, the workhorse of many airlines and the second best-selling jetliner family of all time (after Boeing’s venerable B737). ↑ "Boeing firms up 737 replacement studies by appointing team." Flight International, March 3, 2006. Retrieved: April 13, 2008. ↑ Hamilton, Scott. "737 decision may slip to 2011: Credit Suisse." flightglobal, 2010. Retrieved: June 26, 2010. ↑ "Boeing and American Airlines Agree on Order for up to 300 Airplanes". Boeing, July 20, 2011. Retrieved: November 1, 2011. ↑ "Boeing Launches 737 New Engine Family with Commitments for 496 Airplanes from Five Airlines." boeing.mediaroom.com, August 30, 2011. ↑ "Boeing officially launches re-engined 737." flightglobal.com, August 30, 2011. ↑ Board Approves Re-Engined 737&channel=comm "Boeing Board Approves Re-Engined 737." Aviation Week, August 30, 2011. ↑ Dekkers, Daniel, et al. (Project 2A2H). [home.deds.nl/~hink07/Report.pdf "Analysis Landing Gear 737-500."] Hogeschool van Amsterdam. Aviation Sudies. October 2008. Retrieved: August 20, 2011. ↑ "Fuel Dump." Boeing. Retrieved: August 20, 2011. ↑ Cheung, Humphrey. "Troubled American Airlines jet lands safely at LAX." tgdaily.com, 2 September 2008. Retrieved: August 20, 2011. ↑ Freitag, William; Schulze, Terry (2009). "Blended winglets improve performance" (PDF). Aero Magazine. pp. 9, 12. Retrieved July 27, 2011. ↑ 64.0 64.1 Volkmann, Kelsey. "Boeing gets OK for new carbon brakes." St. Louis Business Journal via bizjournals.com. Retrieved: April 22, 2010. ↑ Wilhelm, Steve. "Mindful of rivals, Boeing keeps tinkering with its 737." Puget Sound Business Journal, August 8, 2008. Retrieved: January 21, 2011. ↑ 66.0 66.1 66.2 Kingsley-Jones, Max. "Narrow margins: Airbus and Boeing face pressue with the A-320 and 737." flightglobal.com, October 27, 2009. Retrieved: June 23, 2010. ↑ 67.0 67.1 "Check Out Boeing's Swanky New High-Tech Interior." businessinsider.com. Retrieved: November 1, 2011. ↑ Yeo, Ghim-Lay (1 November 2010). "PICTURES: MAS takes delivery of first 737-800 with Sky Interior". Flightglobal.com. ↑ "Wolkenlos in Seattle – an Bord des neuen Jets von TUIfly." podcastexperten, March 7, 2011. Retrieved: May 12, 2011. ↑ "Continental Airlines Is First North American Carrier to Fly With Boeing's New Sky Interior." Continental Airlines, December 29, 2010. Retrieved: March 14, 2011. ↑ Bowers 1989, p. 496. ↑ Sharpe and Shaw, 2001, p. 41. ↑ 73.0 73.1 73.2 73.3 "About the 737 Family." The Boeing Company. Retrieved: December 20, 2007. ↑ Shaw, 1999, p. 7. ↑ Endres, 2001, p. 129. ↑ Fisher, Lawrence M. "Boeing Gets Orders for 63 737-X." The New York Times, November 18, 1993. Retrieved: February 1, 2008. ↑ "Alaska Airlines and Horizon Air Aircraft Information."alaskaair.com. Retrieved: June 7, 2011. ↑ "Next Generation 737 Program Milestones." The Boeing Company. Retrieved: January 22, 2008. ↑ "Next-Generation 737 Production Winglets." Boeing. Retrieved: February 10, 2008. ↑ "Bombardier Launches CSeries Jet." The New York Times, July 13, 2008. ↑ "Boeing 737-600/700." airliners.net. Retrieved June 7, 2011. ↑ "Boeing 737-700 Technical Information." Boeing Commercial Airplanes. Retrieved: September 3, 2010. ↑ "The 737 Story: The Long Stretch." FlightGlobal, July 2, 2006. Retrieved: April 22, 2010. ↑ "Boeing 737-700ER Technical Information." Boeing Commercial Airplanes. Retrieved: September 3, 2010. ↑ "Boeing 737-800 Technical Information." Boeing Commercial Airplanes. Retrieved: September 3, 2010. ↑ "Boeing 737-900ER Technical Information." Boeing Commercial Airplanes. Retrieved: September 3, 2010. ↑ "737 family." boeing.com. Retrieved: September 3, 2010. ↑ "Boeing Introduces 737 MAX With Launch of New Aircraft Family". August 30, 2011. Retrieved November 9, 2011. ↑ "AIRSHOW-Boeing 737 draft orders reach 700". November 12, 2011. Retrieved November 18, 2011. ↑ "Boeing sets record with $22 billion order". CNN Money. November 17, 2011. Retrieved February 15, 2012. ↑ "World Airliner Census". Flight International, August 24–30, 2010, pp. 26–49..
↑ "Boeing Delivers the 7,370th 737". MediaRoom. ↑ "737 tops 10,000 orders" Boeing.com, July 12, 2012. Retrieved: July 20, 2012. ↑ "Boeing 737 MAX Gets Milestone Order from Aviation Capital Group". MediaRoom. ↑ "Boeing 737 incident occurrences." Aviation-Safety.net, May 23, 2010. Retrieved: May 23, 2010. ↑ "Boeing 737 Accident summary." Aviation-Safety.net. Retrieved: May 23, 2010. ↑ "Boeing 737 Accident Statistics." Aviation-Safety.net, December 3, 2007. Retrieved: Retrieved: May 23, 2010. ↑ "Boeing 737 Technical Information." Boeing Commercial Airplanes. Retrieved: September 3, 2010. ↑ "Boeing 737 Airplane Characteristics for Airport Planning." Boeing Commercial Airplanes. ↑ "Boeing 737 Technical Specifications." boeing.com. Retrieved: September 3, 2010. Anderson, David F. and Scott Eberhardt. Understanding Flight. Chicago: McGraw Hill Professional, 2009. ISBN 978-0-07-162696-5. Sharpe, Michael and Robbie Shaw. Boeing 737-100 and 200. St. Paul, Minnesota: MBI Publishing Company, 2001. ISBN 0-7603-0991-4. Shaw, Robbie. Boeing 737-300 to 800. St. Paul, Minnesota: MBI Publishing Company, 1999. ISBN 0-7603-0699-0. Sutter, Joe. 747: Creating the World's First Jumbo Jet and Other Adventures from a Life in Aviation. Washington, D.C.: Smithsonian Books, 2006. ISBN 0-06-088242-5. This page was last changed on 18 February 2019, at 15:14.